Last week saw over 65 moth sailors descend on the small sleepy fishing village of Borstahusen in southern Sweden. Perhaps uncharted waters for the Moth class however near perfect conditions prevailed all week and the club provided fantastic hospitality – many thought the food was the best they have ever had at any sailing event and the Moth class certain are a hungry bunch after six hours on the water! Day two dawned with less breeze and overcast. Was the thermal going to increase again like the previous couple of days or not? With a 5 hour postponement the fleet waited ashore keeping entertained by the usual debates; was a decksweeper faster or not and what foil should we go out on if we were to go? 3 o’clock came and the fleet were sent out for 3 almost perfect races in 12-15 knots before the breeze died. Lots of foil changes later across the fleet with the changing breeze, Dave manages another 2 race wins and the other going to Paul Gliddon (shortened North rig), taking his first ever moth race win. The top three – Dave, Carlo and Paul now were close on points with Tom Offer (Lennon decksweeper), Adriano Petrino (KA decksweeper), Benoit Marie (Custom decksweeper) and Andreas John (Lennon standard) all making some appearance as top three finishers. Day three racing started on time and with a much lighter breeze, the weed in the water became a real issue and many of the fleet were forcing capsizes to clear the grass like clumps off their foils. 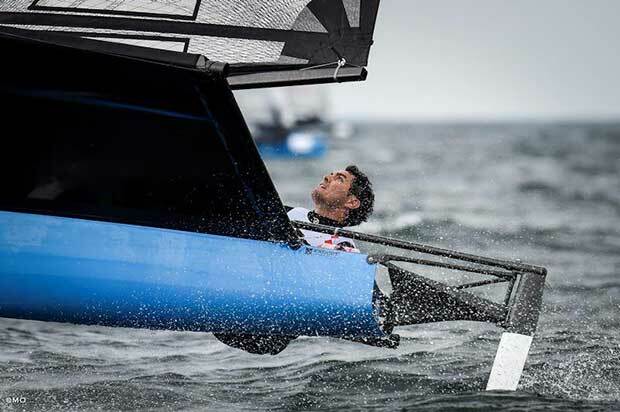 The unavoidable weed clumps forced a pretty quick de-acceleration from foiling to low riding. The only solution was to foil as high as you dare to stay above most of the weed, and try to clear weed on a tack. Lighter sailor Paul Gliddon managed to stay in pressure and took a comfortable win in the first race, before the thermal kicked in again and weed seemed to become less of an issue for the fleet. Dave then managed another two race wins, with the last going to Carlo. Dave was on a roll and the question was, with only half the scheduled races completed, could he win his first Moth event after four years? Back in the pack the fight for first youth was starting to get tight with Alexander Ringstad and Jacob Clasen only a few points away from each other. 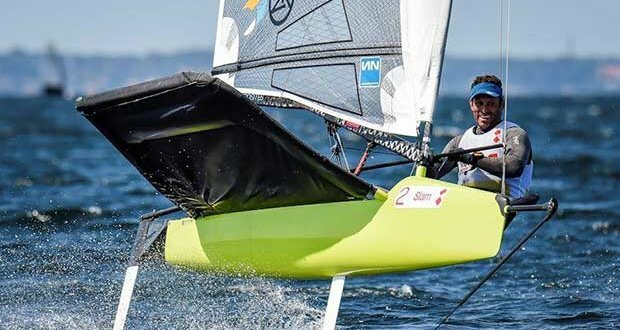 Day four turned out to be another four-race day and with another 10-15 knots the fleet was getting tired. Physical fitness is key and even the race winners were starting to feel it. Benoit Marie made a pretty awesome comeback having had a few sketchy races at the start of the week winning three of the four races. Dave took another win, and the 1st Female race was getting closer with Emma Gravare closing the gap on Josie Gliddon. But perhaps it was all too late…. Final day of racing wasn’t looking good whichever weather model the sailors looked at and whilst PO, the race officer, did his best to get a race going it was just not going to be. Day’s four results stood and finally Dave managed to be crowned European Champion! Massive thanks to the club and event sponsors for a well organised championship and to Martina Orsini for the incredible photos taken during the event.